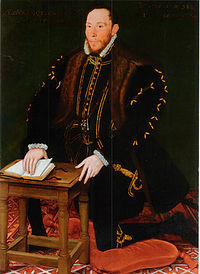 Thomas Percy 7th Earl of Northumberland gained the rather unflattering nickname Simple Tom. He was a key figure in the Northern Rising of 1569. He’d met Mary Queen of Scots on her journey to Carlisle in May 1568 and it was to Northumberland that Mary, during her journey from Bolton Castle to Tutbury, sent a gold ring with a reminder that he’d promised to help her. Northumberland was not only in contact with Mary. He also had links to the papacy in Rome and to the Duke of Alva in the Low Countries. His forceful wife Ann was an ardent Catholic. Percy had other reasons for resenting the English establishment. He’d lost the lucrative wardenship of the East marches that he regarded as his birthright and in addition the revenue from copper mines found on lands he owned near Keswick had been commandeered on behalf of the State by Cecil. He found himself drawn into a scheme later described as incoherent and aimless along with the Earl of Westmoreland and Leonard Dacre. The aim was to raise the north, march south and free Mary Queen of Scots from captivity. She was then to marry the Duke of Norfolk. The earls would then rid Elizabeth of her poor advisors (Cecil). The rising began before the rebels were ready. Panic caused by the arrest of the Duke of Norfolk, led to the church bells in Topcliffe being rung backwards on the 9th November 1569. It was the middle of winter – exactly the wrong time for a rebellion. Before long the rebels found themselves sandwiched between a force from the south led by the Earl of Warwick and a combined force from the north led by Sir John Forster and Henry Carey, Lord Hunsdon. Mass was said in Durham. Hartlepool was captured so that the Duke of Alva could land but the earls did not receive the support that they’d relied upon. It wasn’t long before they found themselves turning north towards home. The rebels and the forces loyal to the queen, including Percy’s brother Henry, fought briefly at Chester Dean near Hexham. Percy and his fellow conspirator the Earl of Westmoreland fled the field along with Percy’s wife. They rode as fast as they could to Naworth Castle, home of the Dacre family. Leonard Dacre had been a conspirator but had changed sides. Now he kept his doors firmly shut against the desperate earls. His brother Edward led them into Liddesdale and left them in the hands of the Armstrongs who were notorious border reivers. It was said of Jock of the Side’s home that it wasn’t fit for a dog kennel. Ann was left with Jock of the Side and Black Ormiston. One or the other of these borderers relieved the countess of her jewels and her horses. She was eventually rescued by the Kerrs of Ferniehurst who traditionally feuded with the Percy family but who were loyal to Mary Queen of Scots (sounds like a complicated game of chess). Henry Percy’s ill luck continued. He found himself separated from the Earl of Westmoreland and was betrayed by Hector Armstrong of Harelaw into the hands of Martin Elliott who promptly handed the unhappy earl into the clutches of Moray. Moray sent his prize to Lochleven Castle where he remained for the next two years while the English and the Scots negotiated with one another over the best price for Simple Tom. During this time Ann, Countess of Northumberland escaped abroad to raise the money to ransom her husband from the Scots. It did little good. Percy was escorted into England in 1572. He believed that he was going to make his peace with Elizabeth. Upon his arrival in York on the 22nd August 1572 he was executed somewhere near Low Pavement and buried in St Crux Church near the Shambles. The church was demolished and the site of his burial lost during the Victorian period. However, the nineteenth century also saw his beatification – so Simple Tom became the Blessed Thomas Percy, Seventh Earl of Northumberland. This entry was posted in Anglo-Scottish history, Border Reivers, Mary Queen of Scots, Sixteenth Century and tagged Black Ormiston, Duke of Norfolk, Durham, Earl of Westmoreland, Hartlepool, Hector Armstrong of Harelaw, Henry Carey, Jock of the Side, Kerrs of Ferniehurst, Leonard Dacre, Liddesdale, Lochleven Castle, Mary Queen of Scots, Naworth, Northern Rising, Simple Tom, Sir John Forster, the Earls Rebellion, Thomas Percy 7th Earl of Northumberland by JuliaH. Bookmark the permalink. Did you know that there is a saying in the Scottish Borders which stems from the time of the 1569 Rebellion. It is ‘to take Hector’s Cloak’ which means to betray a friend. I have written a post on my blog about the involvement of the Border Reivers in the 1569 Rebellion. The current Duke of Northumberland is a male line descendant of Hardwin de Scales, one of Alan Rufus’s men, as was Hardwin’s brother Brian of Scales and Brian’s son Everard. Hardwin’s family adopted a variety of surnames of the centuries: Smithton and Percy are two of them. Sorry, that’s “Smithson”. An illegitimate member of the family founded the Smithsonian Institute.